Toshihiro Nagoshi (名越 稔洋, Nagoshi Toshihiro, born on 17 Juin 1965 in Shimonoseki, Yamaguchi) is a Japanese video gemme producer an designer. He is the Chief creative officer for Sega an a buird o director for Atlus (umwhile Sega Dream Corporation). He jyned Sega in 1989. Nagoshi graduatit wi a degree in movie production an jyned Sega shortly thareefter, wirkin for the seicont arcade depairtment (AM2) at Sega unner Yu Suzuki as a CG designer. His first teetle wis Virtua Racing as a chief designer. Efterwairds he creatit his awn racin gemme, Daytona USA, whaur he wis producer, director an chief designer. He creatit mair arcade racin gemmes wi Scud Race in 1996 an Daytona USA 2 in 1998. Bi 1998, Nagoshi haed his awn arcade depairtment, whaur he wirkit on SpikeOut. In 2000, Sega separatit its in-hoose R&D departments frae the main company an established thaim in nine semi-autonomous subsidiars, wi each gettin an electit preses as a studio heid. 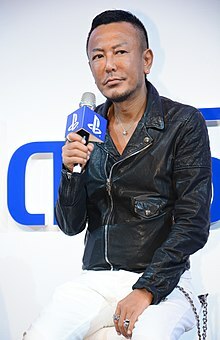 Toshihiro Nagoshi became heid o Amusement Vision, whaur he further contributit tae Sega's arcade line-up wi Planet Harriers, SpikeOut sequels an spin-affs. For Dreamcast he remade his vera first game, Daytona USA as Daytona USA 2001. As Sega became a third-pairty, he muivit oot o arcade development. Amusement Vision became maist kent for its wirk on the Nintendo GameCube, wi the first twa Super Monkey Ball teetles in 2001 an 2002, an F-Zero GX in 2003, Nagoshi made in conjunction wi Shigeru Miyamoto. Durin the time o development o F-Zero GX, Nagoshi wrote a regular column in Edge, which wis teetled "AV Out" in reference tae baith Amusement Vision's initials, which wis the name o his development diveesion, an the consumer electronics term "A/V". In 2003, major chynges teuk place at Sega, consolidatin hintle o thair studios. Nagoshi wis appointit tae the group of the company's officers. In 2005, he wis in chairge o the New Entertainment Division at Sega, which hoosit baith his prior team, wi the addeetion o staff that wirkit on Jet Set Radio, Panzer Dragoon Orta an GunValkyrie, that awready producit the Ollie King arcade release at Amusement Vision. Nagoshi launched his Yakuza franchise. The first teetle cost $21 million tae produce an the first PlayStation 3 entry, Ryū ga Gotoku Kenzan! wis mair expensive, wi Nagoshi statin that it his biggest production syne he stairtit wirkin on consumer gemmes. Bi 2009, New Entertainment diminished, an Nagoshi became the R&D Creative Officer of Sega of Japan's Consumer Division. In Februar 2012 it wis annooncit that Nagoshi wad be promotit tae the role o Chief Creative Officer at Sega of Japan, as well as bein appointit tae the company's buird o directors. He teuk up thir poseetions on 1 Apryle 2012. In October 2013, ance Sega Sammy Holdings purchased the bankrupt Index Corporation unner the shell corporation, Sega Dream Corporation, Nagoshi wis appointit as a buird o director for the reformit Atlus. ↑ "The Man Who Won't Leave Sega: Toshihiro Nagoshi". Gamasutra. ↑ "Who's in charge of Atlus now that Sega owns them?". Siliconera. 31 October 2013. ↑ 3.0 3.1 "Profile: Toshihiro Nagoshi". Spong.com. Svend Joscelyne. 12 May 2010. ↑ "Toshihiro Nagoshi Interview - Summer 2006". Engadget. Video Games Daily. 22 June 2006. ↑ "Interview: Toshiro Nagoski". The-next Level. Hasan Ali Almaci & Heidi Kemps. 21 December 2004. ↑ "Sega - 2003 Annual Report" (PDF). Sega Co., Ltd. 2003. ↑ "Yakuza producer brings two games to PS3". Engadget. Andrew Yoon. 18 July 2007. ↑ "Notice of Personnel Changes at SEGA SAMMY HOLDINGS INC. and its Subsidiaries (SEGA CORPORATION, Sammy Corporation and Sammy NetWorks Co., Ltd.)" (PDF). Sega Sammy Co., Ltd. 29 February 2012. ↑ "Atlus parent company Index Corporation being restructured within SEGA". SEGA Nerds. Lee Sparkes. 1 November 2013.